This article is to outline the fact a final prophetic cycle of great importance is not being explained by Jehovah’s witnesses to the level of detail provided by these prophecies once we know they repeat for Messianic Kingdom completion, upon the same prophecies that led to the first Kingdom and Kingdom “birth” proclamation of 1914-1922. In fact the 8th King world government completion, after a final global tribulation (Matt24:29), is also outlined in the prophetic principles present in Daniel 12. Unique world events in Daniel 11:42-45 and the unique spiritual event in the temple judgment of Jehovah’s witnesses in Daniel 8:11-14, will signal the trek to Daniel 12 by way of that world developmental context of Daniel 11:42-45 which can only fulfill in the apex “King North” 8th King world government final phase as it must merge into Daniel 12, sooner or later. Because Daniel 11:42-45 is unfulfilled King North as 8th King prophecy, we know it must lead to a live activation converging into Daniel 12. Because Daniel 8:13-14 is also unfulfilled in Jehovah’s witnesses, we know that signal temple judgment desolation for the UN NGO “transgression causing desolation” (Dan8:13), explicitly connected to the 1990 “disgusting thing causing desolation” (Dan11:31b Matt24:15), must activate in the same period’s commencement in some way. Explicit clues in Daniel 11:40-41 now fulfilling, and Daniel 11:42-43 to begin fulfillment soon, that can only apply to the core globalization developments of 8th King world power consolidation, including the subversion of the Jehovah’s witnesses ministry (Dan11:30-31, 41), must activate further as Daniel 11:42-43 goes into wealth and finance globalization developments in a world tribulatory phase just activating. The climax of the Bethel compromise of Daniel 11:30-35, parallel 8th King/King North activity internal to Bethel in Daniel 11:41, must culminate in the 8th King timed “trampling” of Daniel 8:13-14 modern temple judgment in this forming tribulation context globally. By this final pattern upon Daniel 12 repeating, the very same pattern of the 1914-1919 Kingdom ministry must replicate with the full completion of 8th King world government (Dan12:11), and soon thereafter the full Messianic Kingdom completion (Matt24:30-31), with all 144000 completion (Rev14), only previewed in 1914-1918. It is not just spiritual completions, but the global 8th King world government entity who must be completed (Dan12:11) and publicly stated in intent (1Thess5:1-3), BEFORE Christ can arrive to depose his chief earthly rival. (Matt24:29-31; Rev19:11-21); That 8th King completion (Dan11:45; Dan8:23-25) is the required entity as sovereign rival that Christ awaits the completion of. This prophecy and plain logic is what Bethel conceals the details of not only in prophetic meaning, but plain 8th King globalization developments aiding the process (Rev16:13-16) seen by thousands of world researchers. Tribulation is used by the 8th King to birth world government renditions, and this fourth and final cycle will produce the final world government entity. Thus UN based world government, no matter what it may be called in final “New World Order” form, will eventually provide completion cues along the way (Dan11:42-45; Rev17:11-18), which completion will trigger the full Armageddon response of Jesus Christ. That is why understanding this final cycle in detail and meaning of it’s timed periods in Daniel 8:14 and Daniel 12, is so important. Many religions understand the concept of a final global tribulation period and that it will arrive. Many researchers understand world conditions now intensified by international inter-dependency and financial compromise in private corporate power control also creates a possibility of volatile chain reactions as the massive financial system must continue in critical meltdown that can be accelerated by other global events. What is not so clear to Jehovah’s witnesses is the final cycle tribulation period details. Jehovah’s witnesses know a tribulation is coming, but are not understanding it’s actual 8th King purpose to present world government in the tribulation’s resolution. Thus what it actually leads to first, it’s detailed progression, milestones and aftermath, and how they all relate in a timed order in Daniel 12 repeating is unknown to Jehovah’s witnesses. All that information, is fully detailed in the final cycle of Daniel 12 prophecy that merely repeats the first cycle events of 1914-1922 that led to the League of Nations globalist world 8th kingdom birth. That globalist world government inception “image” appeared in the same Daniel 12 cycle (Dan12:11), that also provided the prophetic framework of the first Kingdom ministry deploying over it’s own global tribulation preview, as the “time of distress” of Daniel 12:1 as WW1 in the 1914-1919 period. That very same pattern of a Kingdom ministry deploying into a global tribulation that leads to 8th King world government, as laid out in initial form in 1914-1919 Daniel 12 preview fulfillment, is what the final Daniel 12 cycle will also lead to in final completion. The completion of the 144000 Messianic Kingdom “body” is the final “sheep” completion initial event of Matthew 24:30-31 to oversee the final global sheep separation to soon follow that Messianic Kingdom completion. That too was previewed in that initial Daniel 12 fulfillment of 1914-1919. That is the world government event that Matthew 24:29 “tribulation of those days” will end into in a co-completing 8th King world government development also culminating as Daniel 12:11 in final fulfillment. Rather than the JW ambiguous end game scenario primed with Bethel inconclusiveness, the 8th King world government will achieve an 8th King world “peace and security” at the end of the “tribulation of those days”. That guaranteed understanding from prophecy and the 8th King formulaic use of tribulation for this world government presentation purpose, is also a new way of understanding the climax of this tribulation period coming up. It will NOT result in “the end of the world”, but instead a full 8th King world government, world pace and world recovery deployment. Thus by the actual detail in 8th King historic patterns and the completely reliable prophetic forecast pattern merging with those 8th King characteristics, it is now far more specific than the current over simplified premature end scenario Jehovah’s witnesses are now painting an ambiguous and incomplete picture of by Bethel engineered error. In effect Bethel is purposely dumbing down JWs in this backwardness in prophecy and globalization to aid their 8th King developmental concealment for over twenty years. In effect Jehovah’s witnesses are now theologically programmed to create a premature expectation in themselves and their audience that will aid bewilderment in a set of world events just beginning a final cycle, not an immediate “the end” that Jehovah’s witnesses are now trying to sell. And this confusion, already primed to get far worse as the JW worldwide organization is desolated in a global tribulation context forming, will be aided by a lack of reliable information regarding this final cycle. And by that the 8th King world government can proceed to completion with no exposure as to prophecy or the sovereign reality that is to culminate at the end of the cycle. Rather than explain the fact a reliable final phase is mapped in Daniel, Revelation and other prophecy, Jehovah’s witnesses for a time will not even realize a final cycle is present in the prophecy repeating Daniel 12. And now we see the UN NGO red flag (Matt24:15) at Bethel, is only part of the subversive, 8th King serving agenda, that Bethel is carrying out. Thus a global tribulation context (Matt24:21; Dan12:1), and the temple judgment priority upon Jehovah’s witnesses first (1Pet4:17), will be a great first signal. The Daniel 8:14 timing further affirms this a true in time. (Dan8:26). This must in some manner lead to the ministerial recovery meaning to deploy into a finally resisted time period of Daniel 12:7 as Revelation 11:2-3 parallel 1260 days. Daniel 11:44-45 events of final “two witnesses” “little scroll” “reports” resistance to mark that Revelation 11:7 removal of a clean “constant feature”, as the 8th King is going into full world government, marks both features of Daniel 12:11 1290 day period beginning. In this way prophetic clues of real world events aid recognition of the period meanings in Daniel 8:14 and Daniel 12. Therefore neither this analysis or the prophecy marks exact dates, but the prophecy does mark meanings of the final periods and events. The prophetic timed periods in Daniel 8:14 and Daniel 12, do have defined significance as to the meanings and the milestones to be marked in those timed periods. 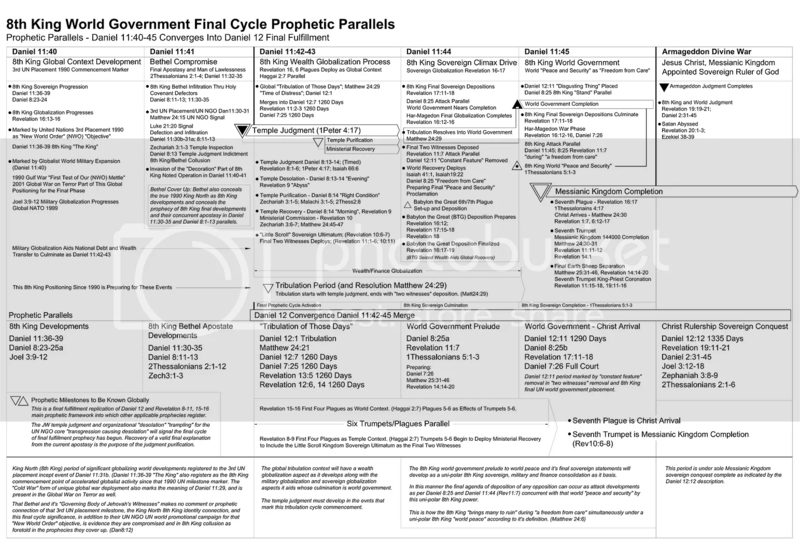 Knowing the general outlay of Daniel 8:14 and Daniel 12 as parallel to Revelation 8-11 as Daniel 11:42-45 activates allows these and other prophetic details to be registered into this final cycle progression. There is in fact much prophetic framework detail that can be drawn from the aid of the understanding that this is primarily leading to a prophetic replication. 8th King historical patterns, such as the use of world war to resolve for world government presentations in 1919, 1945 and 1990 also aids the logical forecast. That national powers must conglomerate into world government as 8th King full “scarlet wildbeast” is thus historic, prophetic and logical. From the Daniel 8:14, Daniel 12 and Revelation 8-11 (Rev15-16) parallel prophetic framework and timings, other prophecy can be cross related into the overall progression aiding understanding of more key details in all the prophets concerning the climax of the whole. From that the actual final cycle meaning can be mapped out by the milestones that must emerge in the final cycle. This is but further evidence Bethel is now a purposefully backward subversion operation aiding instead the 8th Kingdom of Bible prophecy, as foretold and detailed in the same key prophecies Bethel covers up with dated and false interpretations in Daniel 8:11-25 and Daniel 11:27-45 which are all 8th King climax prophecy and their Bethel apostasy and collusion details in reality. That pattern will come true by prophecy and history converging to Armageddon.